Balustrade swing gates provide good security and are generally used where aesthetics are important. 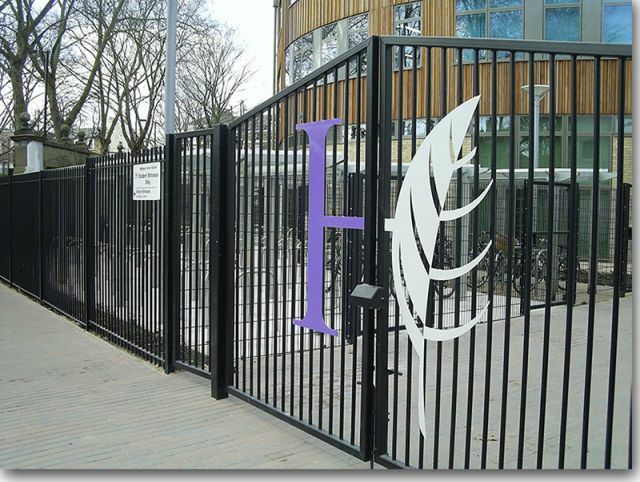 The gates can be finished in company or school’s matching colour scheme and logos can be added. Available in a range of standard heights and specifications to match the style of fencing, balustrade swing gates have an opening width up to 15 m.
Matching pedestrian gates, automation and access control also available including CE marked safety equipment. Consult with manufacturer for details. Hot dip galvanized to BS EN ISO 1461:2009 and polyester coated to a range of RAL colours. Polyester powder coated, RAL - Insert colour requirements.